A signed limited edition digital print, (100 in total) taken from an original artwork in acrylic. 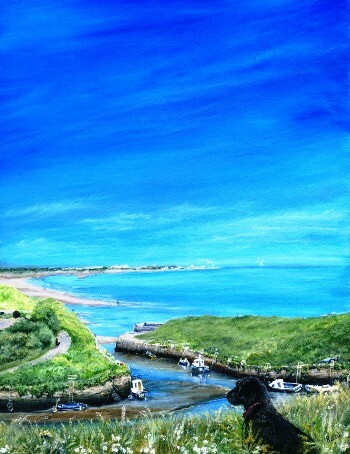 Showing the beautiful harbour of Seaton Sluice in Northumberland. Many small boats are moored on the rivers edge. The tide has receded. The people enjoy working on their boats, or walking along the cliff tops. The beach is lively with holiday makers and families on this lovely summer day. A black labrador sits on the bank side, watching the activity below and simnply, "enjoying the view"